← Hockey, Measurement and Cognitive Dissonance – What do I do with what I know? Our district has a program running within it called Through a Different Lens (TADL). As best as I can tell, it is a whole bunch of things that serve to personalize learning, without being one thing in particular. Even people in the project seem purposefully vague when it comes to attaching labels to it. 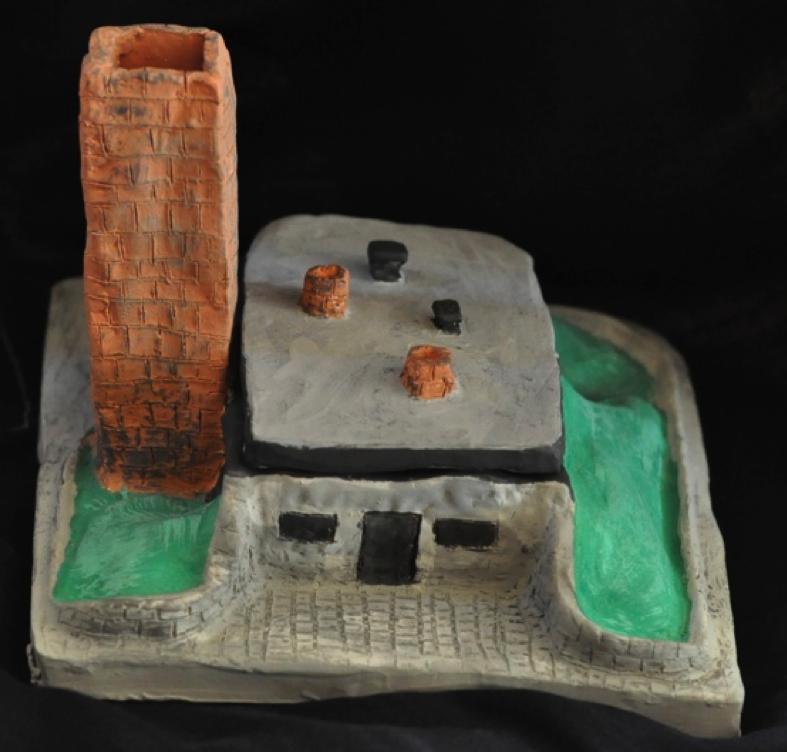 Here is what I mean: A teacher in the project recently posted the results of a cool Math project. Students were asked to go out of the class, in groups of four, and take pictures of fractions around the school property. After deciding that some ‘real world’ scene warranted the classification of a ratio of some kind, the group of students interpreted the mathematical context of the photo using a sentence. Simple. Innovative. Engaging. When I commented to one of the TADL project leaders that it looked a lot like Differentiated Instruction, I was met with, ‘Sure, I guess so,’ followed by a shrug. If the students shared it, call it collaboration. If they receive feedback during the learning process, call it formative assessment. If they review each others photos, I guess it is peer assessment. “And it is their own thing!” Personalized Learning…check. Once in a while you come across a phenomenon that is many good things wrapped up in one, and with that, the very people running it are reluctant to hitch it to one popular term. It reminded me of a great restaurant I visited in Austin last year. After eating an incredible meal, I asked the server what he considered to be the establishment’s specialty. The server responded, “food”. The Through a Different Lens Project is changing lives and you can read more about it at their blog. Good teaching is creative, education needs to be centered on relationships, authentic learning is formative in its processes, and be default all of this is personal. What so many people struggle with is how to assess something that is creative and personal according to learning outcomes that are seemingly both standardized and rigid. I have shared a rather simple assignment template (see example below) with a lot of educators and it allows students to not only be creative, but to also purposefully plan out the medium of their choice and to explain specifically how they plan to tackle the learning objectives. 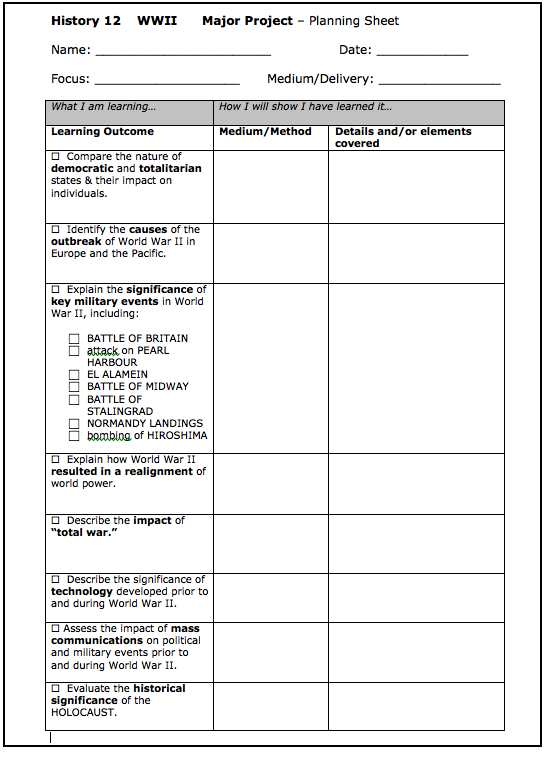 Using this template, the teacher can assess a project that is novel in its approach, but linked to learning outcomes that are well-established. 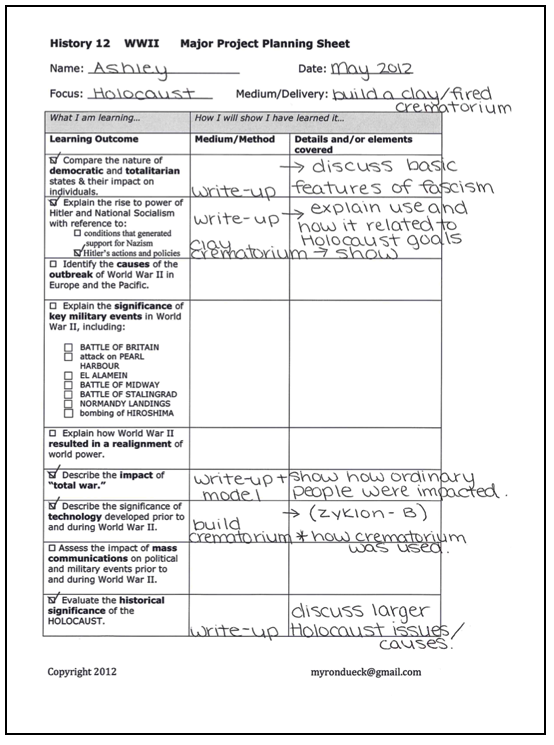 The example below incorporates a template that is preloaded with the existing learning outcomes so that there is no guessing as to what the learning objectives are. Secondly, the learning path begins with clear objectives so that the chances that a great project may go sideways are certainly reduced. This eliminates the conundrum, ‘But it looks so good, it must be good.” Lastly, and most importantly, the student is in control of defining what will be investigated and the manner in which it will occur. Assessing this Holocaust project was really easy for me, as the student’s ‘assessment map’ was presented with the project. I must say that the idea behind this template is much like the TADL project: a result of collaboration with Naryn Searcy. Great thoughts, buddy. There is a fantastic teacher at our school that uses formative assessment on a regular basis. I made the mistake of trying to put what she does in the box of AFL – and she basically said to me (in much nicer words) “don’t try to give this all a name… I just do what I find works and helps the kids learn and love learning”. As much as there are certain aspects that we know truly help, your thoughts are a good reminder not to get caught up in the attempt to give it a name. Thanks again. I agree that is is a good reminder. There are those people in our society that don’t buy clothes with brand names splashed across them, and these same folks may not want the blended strategies that they are using to be categorized in one place or another. I have always contended that terms like AFL, DI, Sound Grading, etc… serve us well to provide a conversation framework. I need a reminder from time to time to back off on the overuse of these very terms. Sharing Circle – My foray into the unknown. The views expressed on this site are those of Myron Dueck and do not necessarily reflect those of Penticton Secondary or School District 67. Neither do the views and opinions expressed on this site reflect those of the partner groups with whom Myron Dueck is associated.